David Simmonite attempts his first ever XS graded route, Rockaway Beach (XS 5b, 4c), in Pembroke in the company of James Pearson. CLIMBER magazine is bi-monthly with 6 issues per year. Our aim is to bring you a brighter magazine with inspirational articles throughout the year. A competition in each issue to win great prizes. A stunning gallery of photographs from the best photographers. A new style crag feature focusing on easier routes for those starting out or transitioning from indoors to outdoors. 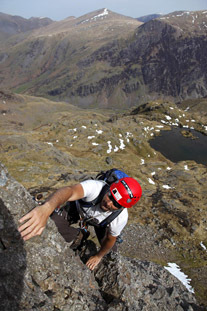 This will include all the information you need to get you to a crag and start climbing. A regular column from top climbing duo James Pearson and Caroline Ciavaldini. More in depth articles on a variety of subjects that matter and are intrinsic to climbing and mountaineering. Plus our renowned gear reviews get bigger, superb destination features, Ascent of Man, Around the Bloc bouldering, bigger interviews, coaching and more. It is an exciting future for Britain’s top magazine for all climbers. Sign up to the Climber email newsletter (box at the top right of this page) for info on the latest magazine, offers, competitions & more. Climber is a bi-monthly magazine appealing to experienced climbers and those just starting out. 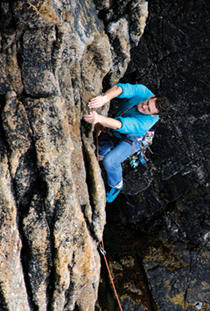 Written by climbers, for climbers, it provides topical, detailed coverage of the climbing scene. Packed full of stunning photography, features on UK and overseas climbing, exclusive interviews, latest gear reviews, expert tuition with top skill tips and training advice, a monthly bouldering feature and more. Climber magazine is available 6 times a year, both in print at newsagents or gear shop, or as a digital download straight to your phone, tablet or computer. Check out the great subscriptions offers here to have it delivered straight to your door. Up-to-date news, key events and industry chat. Expertly written UK and overseas destination articles plus reviews of gear & books. Training & climbing skill tips from experts. Inspirational stories in Climber’s Voice section. Watch quality videos and see stunning photography in the gallery. Chances to WIN great prizes here. Insightful interviews of both legendary and up-and-coming young climbers.